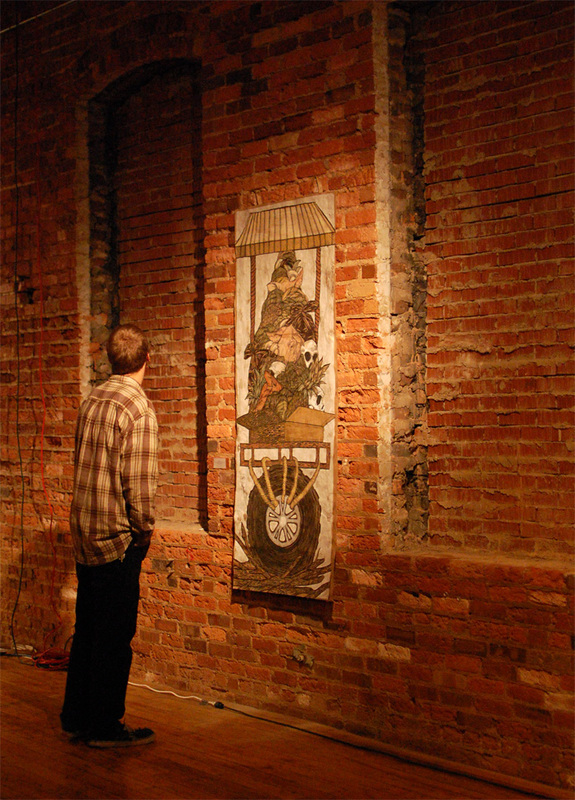 Dugg Dugg, an upstart art gallery in NoDa, created a buzz upon opening last April. It was closed by June – a victim of costs and code enforcement. The historic NoDa factory building was returned to the stewardship of insects and dust, but this would only be the beginning of Dugg Dugg’s evolving life. Co-founders Iris Williamson and Andrea Brown didn’t give up on their dream. The two, along with supportive friends, held a new show titled “American’s Children’s Home” on Oct. 23rd at a new location in historic South End. The former auto repair shop and warehouse at 130 West Bland Street provided a fitting setting for the gallery. Dugg Dugg had evolved into a nomadic gallery, always seeking to try something new. In January, Dugg Dugg presented Platonic Voyage at Story Slam, a performance installation that took participants on a 24 hour voyage across the seas. The latest incarnation of Dugg Dugg is at NC Music Factory in Uptown. On Friday, March 19th, Brown and Williamson held the opening of “1/1000 sq/ft.” Later in the evening, Maury Gortemiller gave a biographical presentation on competitive apnea. Included in the artworks are two towers by Steven Abadie. Standing ten feet tall, they occasionally beep Morse code between themselves. The largest piece of the exhibit is a life-sized “Ohka” aircraft created by Taro Hattori, an artist-in-residence at the McColl Center for Visual Art. Williamson reports the installation took two days to set up. Viewing of the “1/1000 sq/ft” exhibit is still available by appointment, and be on the lookout for the next incarnation of Dugg Dugg in another part of the city. Man, this new site re-design is really rad for showcasing your photos. Also, this post is a great example of blogging best-practices, I noticed! Deep linking to a variety of things, short, interesting, easily digested. Thanks James! Taro Hattori is amazing.. His residency is ending at the McColl center I believe this week, but I believe he is working on several pieces for them.… Each month the McColl Center opens the doors free to the public to visit with the artist. I find that to be quite a treat..
Congratulations to Dugg, Dugg for not giving up on their passion, and I look of forward to their next move.